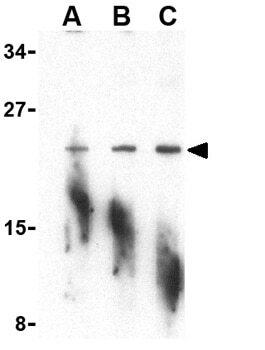 This antibody is specific for BIT1. Synthetic peptide corresponding to Human BIT1 (N terminal). Our Abpromise guarantee covers the use of ab36990 in the following tested applications. ICC/IF: Use at a concentration of 2 µg/ml. WB: Use at a concentration of 1 - 2 µg/ml. Detects a band of approximately 23 kDa (predicted molecular weight: 20 kDa). Can be blocked with PTRH2 peptide (ab39732). The natural substrate for this enzyme may be peptidyl-tRNAs which drop off the ribosome during protein synthesis. Promotes caspase-independent apoptosis by regulating the function of two transcriptional regulators, AES and TLE1. Belongs to the PTH2 family. All lanes : A20 cell lysate. The arrow next to the image points to the BIT1 band. 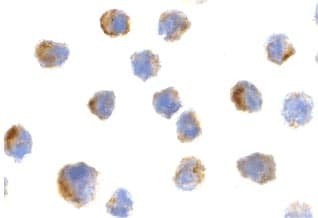 Immunofluorescence of Bit1 in 3T3 cells using ab36990 at 20 ug/ml. Publishing research using ab36990? Please let us know so that we can cite the reference in this datasheet. There are currently no Customer reviews or Questions for ab36990.